Growing up, I didn't care much for Easter egg hunts and Eater bonnets. For me, Easter began when our next door neighbor sent over freshly baked hot cross buns on Good Friday morning. Warm, nutmeg -scented, raisin -heavy buns topped with a smooth, gooey glaze made even more gooey by the still warm buns. Hers were the best. I remember one Good Friday morning foregoing breakfast just so that the firs thing I could savor that morning was one of those buns. So you could imagine my surprise, and disappointment, upon realizing that hot cross buns are not as popular here in the States as they are in the Caribbean, or in the Commonwealth of Nations (former British colonies) for that matter. The British left their mark in more ways than one in those places. The judicial system, education, sports- ever heard of cricket? - religion and food. (The title of this post is also British; from an old nursery rhyme.) In the case of hot cross buns, the last two are closely connected: they were only eaten on Good Friday because, in Christianity, the cross symbolized the crucifixion of Jesus Christ. 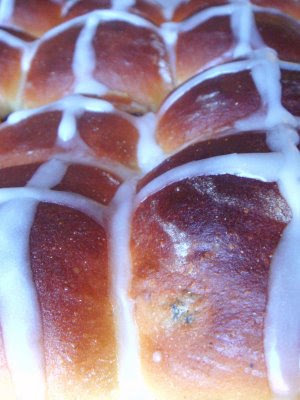 However, these breads dated as far back as pagan times when early Anglo-Saxons eat them in honor of the goddess Eostre. The difference was that the cross was not a crucifix at all but two intersecting lines used to symbolize the four corners of the moon. At its inception, the symbolic cross was carved in with a sharp knife, not marked with icing as is done today. (I prefer the change to icing better!) In this recipe, the dough is extra sticky and has the potential to get messy but it will be worth it in the end. They taste better warm, like all bread, but can be frozen and keep for up to two weeks. 1. Sift together flour, spices and salt. Set aside. 2. Add the warm milk, yeast and 1 tbsp of the sugar to the bowl of a standing mixer, stir lightly with a spoon and allow the yeast to bloom, about 10 to 15 minutes. Add eggs, sour cream and the remaining sugar. Using the paddle attachment mix until just combined. Replace the paddle with the dough hook attachment. 3. Now add the flour and knead on low for five minutes. 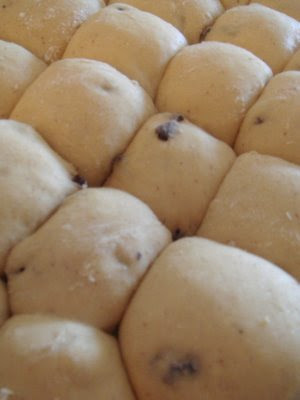 Do not be to alarmed if you find that the dough is sticky; this is a wet and sticky dough. Remove the mixing bowl with dough to a dry place in the kitchen, cover and allow to rise until doubled in sized, between 1 to 2 hours. 4. Set the oven to 400 degrees F. Now return the dough in the bowl to the mixer and add the raisins or currants. Mix for two more minutes until all of the raisins have been evenly incorporated into the dough. 5. Transfer the dough to a floured work surface and lightly pat into an evenly round mass, using extra flour from your work surface to prevent sticking. Cut into 12 large pieces or 24 smaller ones. Shape each piece into a ball and transfer to a well greased baking dish so that they barely touch one another. Cover, set aside and allow to rise for another 1 hour. 6. Brush tops with egg whites and bake at 400 degrees F for 10 minutes. Reduce oven to 300 degrees F and bake for a further 10 to 12 minutes. Remove the baking dish from the oven and transfer unto a cooling rack. Cool buns for 2 to 3 minutes in dish, then remove and cool directly on the wire rack. While they are still warm to the touch, drizzled the glaze in a cross pattern on each bun. Serve. To make glaze: Mix all ingredients until well combined. Delicious! My family lived in Canada for 9 years but I don't recall having hotcross buns for Easter - boy, did we miss out! These are beautiful! What great pics! i came on your blog just to look at these pics! 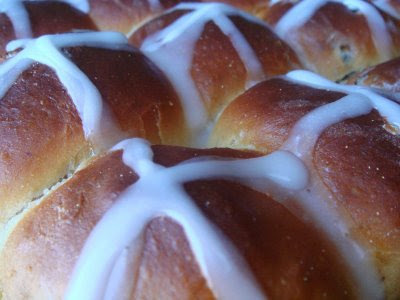 ;) i've been craving for hot cross buns man! Jessie, It's good to know that you liked the story about these. Sometimes it helps us to look at our foods in a different way. Finsmom, thanks for visiting. Hope you get to try these.